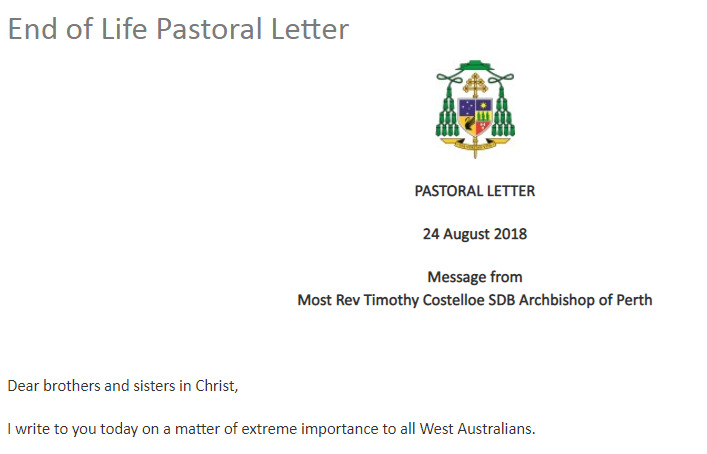 I write to you today on a matter of extreme importance to all West Australians. In State Parliament this week a Committee of Inquiry presented its report on end-of-life care in Western Australia. 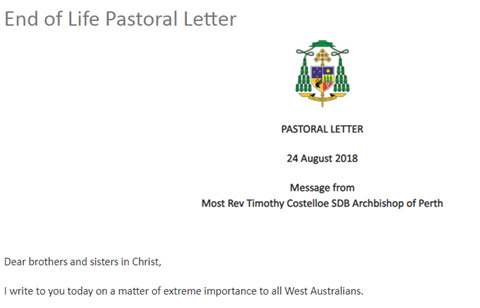 Over 700 submissions were received, including my own on behalf of the Catholic community in the Archdiocese of Perth. Less than 36 per cent of submissions favoured the introduction of some form of doctor-assisted suicide or euthanasia, but the Committee chose to recommend that laws to permit what it calls ‘voluntary assisted dying’ should be introduced in this State. Doctor-assisted suicide involves authorising a medical professional to supply help so that a person can end their own life. In euthanasia, the doctor uses medical means to end the person’s life directly. Both of these represent a radical breach in the universal prohibition on one person killing another, which is a foundation of every civilized society. We must be very clear that doctor-assisted suicide and euthanasia are never acceptable in a truly compassionate society. Compassion is the ability of one person to accompany another caringly through their journey of pain and suffering. Compassion challenges us to become more humane and caring people. Doctor-assisted suicide and euthanasia represent a surrender to despair. In contrast to these death-dealing measures we value the ‘message of eternal life’ that Jesus brings. Jesus’ mission as the Good Shepherd, the one who comes ‘that they may have life, and have it to the full’ (Jn 10:10), was to offer deep personal compassion that touched and healed every aspect of life for people who had known only diminishment by illness, fear, or social marginalisation. As Jesus’ followers, our Catholic community shares his mission in our own time and place. We are justifiably proud and grateful for the generous and compassionate care provided through our extensive network of hospitals, aged care facilities, and disability and social services. We do not keep people alive at all costs, however neither do we intentionally kill. To those whose lives are diminished by chronic pain and suffering we offer the best comfort care and pain control available, always in the context of excellent pastoral, social and spiritual support. Because it focuses on the needs of the whole person, this care brings profound comfort and peace not only to the patient or resident, but also to their family and friends. The laws proposed in WA present a serious challenge to human dignity in this State. I call on every Catholic to do whatever we can to extend compassionate life-affirming care for the elderly, the sick and the dying, so that no-one ever feels alone or abandoned. And I call on all Members of Parliament to stand up for the human dignity of our most vulnerable citizens by devoting greater resources to specialist palliative and comfort care, and by refusing to legalise doctor-assisted suicide or euthanasia.